The rooms all have private W.C., private balconies with a sea view, TV, air-conditioning and refrigerator. 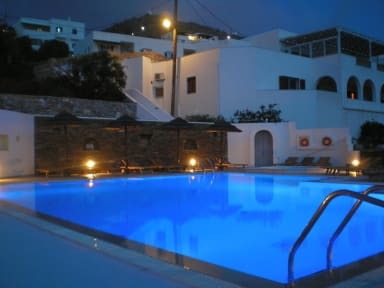 There is also a lovely swimming pool and baby pool with a breath-taking view of the port. You can have breakfast in the breakfast room, terrace, or by the pool.You can relax by the swimming pool on the sunbeds with towels which are given to you at the reception. There is a satellite TV. lounge and bar. It is also 250 m from the beautiful, sandy beach called Yialos.